Mike Williamson has apologised for his actions but denies he got sent-off deliberately. 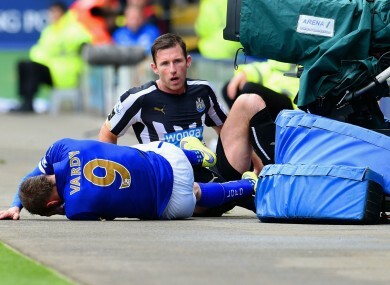 The defender saw red for a needless and rash challenge on Jamie Vardy yesterday. NEWCASTLE UNITED DEFENDER Mike Williamson has apologised for his dismissal in the 3-0 defeat to Leicester City, but insists he did not get himself sent off on purpose. Williamson was red carded in the 62nd minute of Saturday’s clash at the King Power Stadium, receiving a second booking for a rash challenge on Jamie Vardy. With the defeat leaving Newcastle just two points clear of the Premier League relegation zone, head coach John Carver claimed that Williamson may have fouled Vardy to miss two of his team’s final three games. But, in a statement released on Sunday, Williamson said: “I would like to take this opportunity to apologise to the Newcastle United supporters and my fellow team-mates for getting sent-off during yesterday’s game. “There was absolutely no intent to hurt Jamie or get sent-off, but I recognise that I should have been more composed and measured in my determination to win the ball. “Unfortunately, it did the one thing that I never wanted to do, and that was to hurt the team. “Moving forward, I will do whatever I can to help my team-mates prepare for the next two games and fight to get back into the team when I’m next available. Email “'I'm privileged to play for Newcastle and wouldn't do anything intentionally to hurt the team' ”. Feedback on “'I'm privileged to play for Newcastle and wouldn't do anything intentionally to hurt the team' ”.